They came at dawn. They wanted the element of surprise, for their prey was cunning, unpredictable, and dangerous. So dangerous in fact, that they needed to arrive in coordinated teams, use stun grenades, have automatic weapons at the ready, wear body armour and conceal their own identities lest retaliation be wrought upon themselves or their families. They came at dawn. They wanted the element of surprise, for their prey was cunning, unpredictable, and dangerous. So dangerous in fact, that they needed to arrive in coordinated teams, use stun grenades, have automatic weapons at the ready, wear body armour and conceal their own identities lest retaliation be wrought upon themselves or their families. The news media was called to witness their bravery, and to convey their successes in capturing their quarry. Nearly a year ago, on the morning of 30 March 2012, the French wire services and electronic media were awash in images documenting the operations of the Groupes d’Intervention de la Police Nationale (GIPN) - special tactical units operating in conjunction with the French domestic intelligence service (DCRI) - rounding up individuals suspected of extremist Islamist connections. 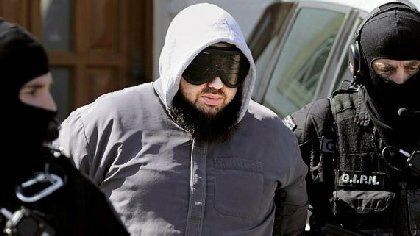 It had been nearly two weeks since Mohammed Merah sent France reeling, killing three children and a rabbi in an attack on a Jewish school, assassinating three French soldiers (each of whom was Muslim), barricading himself in his home and dying in a shoot-out with police. GIPN officers after Merah was killed. Source: Reuters/Jean-Paul Pelissier. Then President Nicholas Sarkozy found the events to be so traumatic that he likened them to a French 9/11. While some analysts and political commentators were cynical that the arrests were merely a last minute attempt by Sarkozy to gain some traction in the then up-coming presidential elections, especially because the media was invited to accompany the police on some of the operations, the raids produced powerful images that were endlessly reproduced in French news media and on the internet. But these images did not merely document events; in many ways these images are some of the best examples of what can be called 'toxic images'. They incite fear, and convey a message of group belonging and membership, by creating objects of fear, to be rejected, and to be understood as representing the other. In these images we see figures that are supposedly so dangerous, that even in their pyjamas, wrestled out of bed in the pre-dawn hours of the morning, they can only be handled by police outfitted in full body armour, in the possession of automatic weapons, with back-up support. What is conveyed through these images is that should the public see similar figures – men with long beards, wearing keffiyas, or thobes – they should see these men as potentially dangerous, potentially toxic. This message is transmitted through both the image and its reproduction. That is, its prevalence, its ubiquity conveys an authenticity to the reading of this image. But how? The depiction or portrayal of the enemy is important to shape 'our' responses to them; it unites 'us' in our shared revulsion, and it indicates who might be potentially viewed with suspicion should he or she not share our fear or revulsion. Corey Robin in discussing the political use of fear suggests that “understanding the object of our fear as less than a political agent, allows us to treat them as intractable foes”; that is, “if nothing can be done to accommodate them; they can only be killed or contained” . The French images convey something very similar: there is no accommodating a figure that can only be approached in body armour. It becomes important to understand the object of fear as beyond politics, because to do otherwise would be to hold open the potential for political, and thus social, engagement. The toxic image is one that unsettles the sense of security by showing an 'enemy among us'. It transforms the potential for an enemy hidden among us into a reality by 'demonstrating' that indeed the 'hidden' enemy has been'discovered'. In the case of the French arrests, both the French government and the news media made repeated statements that the people arrested were not “connected to Merah”. So while discussing the Merah case, and the impact of the shooting, the French police arrested nearly 30 suspects, on suspicion of commiting terrorism, but none were arrested in direct connection to the actual shooting event. In this way it is no longer a question of a 'false' or 'true' representation of reality, for the imagery is no longer 'true' or 'false'. Rather all of this is simultaneous true, representing simultaneous and multiple truths, while at the same time creating whole new realities by joining these truths together in a single image. Mohamed Achamlane arrested. Source: FranceTV. Another example of such a toxic image comes from the Second World War. In a poster from Ustaša Croatia, the fascist government warns its citizens of the danger of typhoid, by equating it with the danger posed by the communist partisans. In this way, the partisans are not political challengers to be engaged or debated, but are rather identical to the parasites that transmit typhus. The partisans are typhoid. They must be contained or eliminated. The double slogans “Beware of Partisans” and “Beware of Typhus” are joined in the image of the parasite with the partisan head. How does this equivalence work? Just as metaphors are short descriptions, images are representations. They are the conveyance of an idea, possibly the abstract or the sayable rendered visible, or the seen reproduced as a dissemblance. On the one hand images can be a simple relation that produces a likeness of an original – not necessarily its faithful copy or reproduction, “but simply what suffices to stand in for it” [2}. A picture for a word might be such an example; an ideogram or phonetic sign stands in for a complex picture . On the other hand there can be an alteration of the resemblance, especially an alteration the significance of which is not intended to accurately render any semblance of likeness, but rather to evoke an emotional, sensual, or visceral response. In the end this may even be a dissemblance . In the example below, the metaphor that the Ustaša believe the communist partisans to be like diseased parasites is portrayed in the dissemblance of both the partisan and the flea into a single body. Jacques Rancière describes such a fusion as “hyper-resemblance”, whereby the “resemblance does not provide a replica of reality, but attests directly to the elsewhere from whence it derives” . In this way the hyper-resemblance is not a mirror but is the statement of a direct vision. It does not reflect a reality, but rather is its own reality. Images circulate around the globe at a blinding speed, one that distorts the context or the accompanying background material that may alter the interpretation of an image. De-coupled from the multiple realities that may inform it, the image can become an icon for other concepts. These pictures constitute a set of replicators, by which images reproduce, seemingly independently, transmutating into representations of something rather different from that for which the original images were concept referents. In this way, circulation is like a contagion, growing more pervasive, and destroying rival or competing images to convey a competing or rival truth. 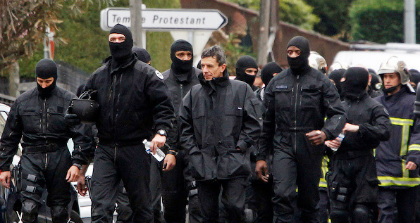 The circulating images from the aftermath of the 2012 Toulouse shootings entreat the French public - if not the wider European public - to be vigilant, suggesting that the objects of fear, the objects of danger that can only be approached with great caution, are men with beards, men in keffiyas. 'We' the French, or the European must be cautious because of others like Mohamed Merah. Commenting on the shootings Nicholas Vinocur wrote, "The fear is there may be more Mohamed Merahs in waiting among Europe's largest Muslim community, of some five million people in France – a worry that may partly explain Friday's roundup of 19 suspected militant Islamists as Sarkozy's government asserts a firm grip on security". Yet if one looks for images of Merah he does not resemble the objects of fear on parade by the French police. Merah is clean shaven, wearing jeans and trainers, and looking very much like so many French young people. Similarly, the young people involved in the 7 July bombings in the UK, and even the twenty hijackers who carried out the 9-11 attacks, did not stand out. The image of the European 'Muslim terrorist' with a beard and looking like a 'jihadi' from so many circulating videos from Iraq, Afghanistan, the West Bank or the Gaza Strip, is a simulacrum: it is a copy without an original. Jean Baudrillard describes the successive phases of the image in his essay, “The Procession of the Simulacra” where in the end, the image “has no relation to any reality whatsoever: it is its own pure simulacrum” . These images create their own reality, their own truths, mostly through the emotional and often visceral response they engender. It is not that the simulacrum represents nothing, but rather that it is an image without a resemblance. Roland Barthes wrote at the beginning of the twentieth century of the immediate alterity of images. That images affect us in two ways: through the punctum, or the immediate pathetic effect it generates, in distinction from the studium, or the information transmitted by the image or the meanings it receives through circulation . Barthes thought the punctum was far more powerful. “The punctum, or the wound left by a photo or image always trumps its studium, the message or semiotic content it discloses” . The shared sense of injury or the shared sense of threat creates an instantaneous series of reproductions, creating a viral circulation. W.J.T Mitchell calls such an image a “bio-picture”, which circulating rapidly, is characterised by its “metastasising life", changing, growing, spreading, and setting up an emotionally normative response far beyond its original contextual bounds. 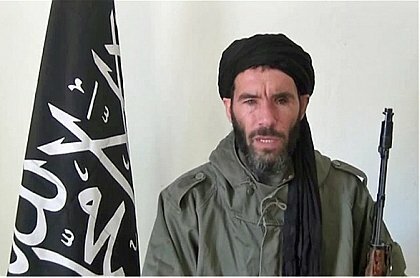 In late January 2013, as France deployed military force in Mali to push back Islamist insurgents, Mokhtar Belmokhtar one of the founders of Al Qaeda of the Islamic Maghreb and the Group for Preaching and Combat in Algeria, masterminded an attack on foreign and Algerian workers at a BP Gas Works in Al Amenas. Instantly people wanted more information about this rebel leader, and within days, the internet was awash with the same image taken from a video. A google search yielded more than 100 different versions of this same image, some attributing copyrights to Agence France-Presse, others to Reuters, to EPA, to Getty Images, even to Wiki Media Commons. But it was nearly impossible to track where the original came from; none of the hundred different sources provided any information on the original provenance of the image. These images became clones: clones of Belmokhtar himself, but also clones of all terrorists. The images are without social integration or social life; they are without context or specificity. A white background sets off Belmokhtar’s face; a black flag with Arabic script bounds the left screen, and is balanced with the thin black vertical line of Belmokhtar’s weapon, surely an AK-47, on the right of the frame. He wears a military style jacket without insignia, which both conveys a martial atmosphere, while suggesting he belongs to no one’s army. He is bearded and wears the headscarf of the Sahel. He neither looks like one of 'us' but nor is he 'unfamiliar', for he appears as the model of the object of western fear. He is the clone among clones presented to the public as the face of danger. As electronic news outlets played micro-clips of the video from which the still images came, they were often on short loops creating an effect that made Belmokhtar appear as if he was an automaton. An undated still photo of Mokhtar Belmokhtar from a video. How do we imagine the invisible? How imagine the abstract or the distant? How do we fill in the blank space in the collective consciousness where the terrorist or the enemy dwells? By giving it a face. Just as the “Beware Partisans!” or other World War Two posters depicted the enemy as vermin or other pestilence, thereby assuring the collective self of the correctness of eliminating - or explicitly killing – the enemy, the images of the other fulfill the desire to 'know' who is responsible for the 'threats against us'. The problem with images of people like Mohamed Merah is that they do look like 'us'. On the one hand this contributes to the idea of an enemy among us, promoting a profound sense of imminent danger. On the other hand it becomes difficult to eliminate those that 'look like us'. Therefore, with a sleight of hand, and a twist of equivalence, the enemy is provided with a new face; one that is distinct from 'ours'. It is recognizable in its difference, and threatening for that same reason. Further, the equation of the 'enemy among us' with the recognizably threatening other, promotes the idea that members of the larger group self, or the 'threatened majority', should be suspicious of the 'real' identities of their neighbours. The larger group self begins to “suspect that the everyday contrastive labels with which [minority peoples] live, conceal dangerous alternate identities” that can only be thwarted through violence . This suspicion, and the accompanying attractiveness of violence, represents a social death of politics: a civicide. It is the death of civility, and is the first step toward the creation of a permissive environment of violence against the other. This is more than de-humanising the other. It is the visual transformation of the other into an object of fear; it is the rendering of the enemy-other into a toxic-image. Robin, Corey (2004) Fear: the history of a political idea (Oxford: Oxford University Press), p.6. Rancière, Jacques (2009) The Future of the Image (London: Verso), p. 6. For a discussion on these transformations and Wittgenstein’s theory of a grammar for images see W.J.T. Mitchell (1986) Iconology: Image, text, Ideology (Chicago: University of Chicago Press), pp. 25-27. Rancière, Jacques (2009) The Future of the Image (London: Verso), p. 7. Rancière, Jacques (2009) The Future of the Image (London: Verso), p. 8. Baudrillard, Jean (1994) Simulacra and Simulation (Ann Arbor, MI: University of Michigan Press), p. 6. Rancière, Jacques (2009) The Future of the Image (London: Verso), p. 10. Mitchell, W.J.T. (2005) What Do Images Want: The Lives and Loves of Images (Chicago, University of Chicago Press), p.9. Appadurai, Arjun (2006) The Fear of Small Numbers: An Essay on the Geography of Fear (London: Duke University Press), p.88.